The following is an incomplete list of airway beacons and arrows. The original list, compiled by Roger Barnes in 2003, was drawn from the NGS database of survey marks. In recent years, many other contributors have shared their knowledge and added other beacon and arrow sites to the list. Many of these beacons no longer exist, but their locations and remains are of historical interest. PIDs are clickable links to the most current NGS datasheets. Any item that does not have a PID is not in the NGS database but was discovered by other methods. View posts tagged "Airway Beacons"
For airway beacons in the eastern U.S., see: Airway Beacons List—Eastern U.S.
Tower at Cottonwood Municipal Airport AZ YAVAPAI 34.735197 -112.039576 COTTONWOOD Y Updated non-NGS beacon/arrow According to the Verde Independent the tower's original location was on Woodchute Mountain, west of Jerome. Tower and beacon light intact. Reported by Dale Whelan. CF0325 PHOENIX EL PASO AWY BCN T 5 AZ COCHISE 31.99128966 -109.3007297 RUSTLER PARK (1978) EL PASO PHOENIX T 5 N N Updated NGS beacon/arrow There appears to be a skeletal structure just East of the given coordinates. No evidence of beacon foundation or arrow. Reported by Dave Tenney. CG0952 PHOENIX EL PASO AWY BCN 16 AZ COCHISE 31.76458815 -110.145521 LAND (1973) EL PASO PHOENIX 16 N N Updated NGS beacon/arrow Foundations visible. No arrow, as of 2/17/2017. Reported by Dave Tenney. CG0975 AVIATION BEACON 45 A AZ COCHISE 31.92027518 -110.3695615 BENSON (1983) N N Updated NGS beacon/arrow Foundations visible. No arrow, as of 2/17/2017. Reported by Dave Tenney. ES1047 LOS ANGELES AMARILLO AWY BN 51 AZ NAVAJO 34.93603671 -110.1401323 HOLBROOK (1986) AMARILLO LOS ANGELES 51 N N Updated NGS beacon/arrow Beacon intact, as of 11/25/2014. Reported by Zhanna. FQ0600 LOS ANGELES ALBUQ AWY BCN 43 B AZ COCONINO 35.10775945 -111.2162753 ANDERSON CANYON (1983) ALBUQUERQUE LOS ANGELES 43B N N Updated NGS beacon/arrow Destroyed, as of 11/25/2014. Reported by Elaine Legate. FQ0604 LOS ANGELES ALBUQ AWY BCN 43 A AZ COCONINO 35.14792553 -111.2755082 ANGELL (1983) ALBUQUERQUE LOS ANGELES 43A N N Updated NGS beacon/arrow Destroyed, as of 11/25/2014. Reported by Elaine Legate. FQ0606 LOS ANGELES ALBUQ AWY BCN 42 AZ COCONINO 35.1529312 -111.4703987 WINONA (1974) ALBUQUERQUE LOS ANGELES 42 N N Updated NGS beacon/arrow Destroyed, as of 11/25/2014. Reported by Elaine Legate. FQ0728 LOS ANGELES ALBUQ AWY BCN 49 AZ NAVAJO 35.0283832 -110.1182608 HENNESSY BUTTES (1993) ALBUQUERQUE LOS ANGELES 49 N N Updated NGS beacon/arrow Destroyed, as of 11/25/2014. Reported by Zhanna. FQ0738 LOS ANGELES ALBUQ AWY BCN 47 AZ NAVAJO 35.02680665 -110.5983262 RINCON RANCH (1986) ALBUQUERQUE LOS ANGELES 47 N N Updated NGS beacon/arrow Destroyed, as of 11/25/2014. Reported by Zhanna. FQ0755 LOS ANGELES ALBUQ AWY BCN 45 AZ COCONINO 35.06959 -110.9834778 TUCKER MESA SW (1983) ALBUQUERQUE LOS ANGELES 45 N N Updated NGS beacon/arrow Destroyed, as of 11/25/2014. Reported by Elaine Legate. Arrow near MX1005, near Gazelle, CA CA SISKIYOU 41.543382 -122.503704 GAZELLE Y Updated non-NGS beacon/arrow Arrow intact, as of 11/17/2013. Reported by Jeff. Beacon at Kelly (Kingston) Intermediate Airfield, San Bernardino County, CA CA SAN BERNARDINO 35.56241 -115.71463 PACHALKA SPRING Updated non-NGS beacon/arrow Beacon destroyed, as of 11/25/2013. Reported by Francis Blake. Beacon at Mesquite Pass, San Bernardino County, CA CA SAN BERNARDINO 35.62491 -115.63303 PACHALKA SPRING Updated non-NGS beacon/arrow Beacon destroyed, as of 11/25/2013. Reported by Francis Blake. Beacon in Acalanes Ridge Open Space near Walnut Creek, CA CA CONTRA COSTA 37.902908 -122.07814 WALNUT CREEK Y Updated non-NGS beacon/arrow Arrow intact, as of 5/10/2014. Reported by Todd Christensen. Restored beacon on Mt. Diablo, CA CA CONTRA COSTA 37.881713 -121.914212 CLAYTON Updated non-NGS beacon/arrow Beacon restored, as of 11/21/2013. Reported by John Gallagher. DB1497 IMPERIAL AIRPORT AIRWAY BEACON CA IMPERIAL 32.83798606 -115.5701632 EL CENTRO (1979) Y N Updated NGS beacon/arrow Beacon restored, as of 8/6/2012. Reported by Norm Wuytens. DX4994 AIRWAY BEACON 3 A CA SAN DIEGO 33.10194238 -116.5789871 JULIAN (1988) N N Updated NGS beacon/arrow Beacon intact, as of 11/18/2013. Reported by Laura. DX5100 LOS ANGELES PHOENIX AWY BCN 9 CA RIVERSIDE 33.92116861 -116.6207475 DESERT HOT SPRINGS (1978) LOS ANGELES PHOENIX 9 N N Updated NGS beacon/arrow Beacon tower and shed intact, as of 4/8/2015. Reported by Elizabeth W.
FS1273 LOS ANGELES LAS VEGAS BN 17 CA SAN BERNARDINO 35.39964029 -115.8313017 SOLOMONS KNOB LAS VEGAS LOS ANGELES 17 N N Updated NGS beacon/arrow Arrow intact (Laura and Francis); Arrow and footings are intact, shed is not original (Michael), as of 3/22/2016. Reported by Laura, Francis Blake, Michael A. Adams. FT1501 LOS ANGELES LAS VEGAS AY BN 13 CA SAN BERNARDINO 35.07755462 -116.3918704 DUNN (1986) LAS VEGAS LOS ANGELES 13 N N Updated NGS beacon/arrow Arrow intact (Laura); Arrow is intact, footings for tower are intact, hill is eroding (Michael), as of 3/22/2016. Reported by Laura and Michael A. Adams. FU3524 DELANO AIRPORT AIRWAYS BEACON CA KERN 35.75226066 -119.2418885 DELANO EAST Y N Updated NGS beacon/arrow The beacon site is an empty lot next to a National Guard building that looks like it was originally part of the airport (before a road was built between it and the Delano Airport runway). No traces remain of the beacon, as of 1/2/2017. Reported by Marici Reid. FU3571 AIRWAY BCN 13 FLASHING RED V CA TULARE 35.86144139 -119.2862862 DELANO WEST N N Updated NGS beacon/arrow No traces remain of the beacon site, in farmland as of 1/2/2017. Reported by Marici Reid. GT1934 LOS ANGELES SAN FRAN AWY BN 15 CA TULARE 36.02110284 -119.3220448 TIPTON LOS ANGELES SAN FRANCISCO 15 N N Updated NGS beacon/arrow The beacon is completely gone as of 1/2/2017. Reported by Marici Reid. GT1963 LOS ANGELES SAN FRAN AWY BN 17 CA TULARE 36.32693676 -119.4002436 GOSHEN (1969) LOS ANGELES SAN FRANCISCO 17 Y N Updated NGS beacon/arrow Per Visalia airport manager, the beacon was moved to Woodlake Airport. We saw the beacon there in good condition. All other beacon structure was destroyed in the construction of highway interchange as of 1/2/2017. Reported by Marici Reid. GT2066 LOS ANGELES SAN FRAN AWY BN 19 CA FRESNO 36.57618316 -119.6532887 CONEJO (1978) LOS ANGELES SAN FRANCISCO 19 N N Updated NGS beacon/arrow No traces remain of the beacon site. Site is farmland as of 1/2/2017. Reported by Marici Reid. HS4842 LOS ANGELES SAN FRAN AWY BN 29 CA SANTA CLARA 37.00802748 -121.2877025 PACHECO PEAK (1978) LOS ANGELES SAN FRANCISCO 29 N N Updated NGS beacon/arrow Pacheco Peak. Radio site owned by State of California. Radio towers and buildings have replaced beacon equipment. Beacon destroyed, as of 3/27/2015. Reported by John Gleichweit. KS1455 SACRAMENTO RENO AIRWAY BCN 15 CA NEVADA 39.32181294 -120.3362179 NORDEN (1979) SACRAMENTO RENO 15 N N Updated NGS beacon/arrow Looking in Google Earth the arrow and tower are especially visible in multiple 2016 images (through 7/2016). Reported by Brian Lee. MX1005 SEATTLE SAN FRAN AIRWAY BCN 27 CA SISKIYOU 41.54772567 -122.4865674 LAKE SHASTINA (1984) SAN FRANCISCO SEATTLE 27 N N Updated NGS beacon/arrow Destroyed, as of 5/14/2014. Reported by Tom J.
Beacon site on Continental Divide Trail near Rollins Pass, CO CO GILPIN 39.917414 -105.683605 EAST PORTAL Updated non-NGS beacon/arrow I read about the airway beacon in an old brochure about the Moffat Road while researching Rollins Pass and then found it on old airway map. It is also referenced on the National Geographic Trails Illustrated Topo map #103. The topo map also indicates a Benchmark there. Reported by Kay Barfield on 3/14/2016. HK0440 EL PASO PUEBLO AWY BCN 45 CO LAS ANIMAS 37.03746431 -104.3312969 BARELA (1971) EL PASO PUEBLO 45 N N Updated NGS beacon/arrow Beacon intact, as of 9/3/2013. Reported by Louis McGinnis. KL0699 LOS ANGELES DENVER AWY BCN 73 CO GARFIELD 39.42263092 -107.3760297 CENTER MOUNTAIN (1987) DENVER LOS ANGELES 73 N N Updated NGS beacon/arrow Tower intact, as of 4/2015. Reported 4/17/2017 by Brian Lee. LL1223 PUEBLO CHEYENNE AIRWAY BCN 15 CO WELD 40.39701853 -104.6907116 GREELEY (1980) CHEYENNE PUEBLO 15 N N Updated NGS beacon/arrow This beacon no longer stands. This location is currently the Mexican restaurant Almanza's. Reported by Allina Condie on 6/5/2018. MH0617 COLFAX AEROPLANE BEACON IA JASPER 41.68091078 -93.23495155 COLFAX (1965) Updated NGS beacon/arrow Destroyed, as of 4/8/2017. Reported by Amanda Kirk, who spoke to the property owners. They knew of the beacon, but it was already gone when they purchased the land 20 years ago. They incorporated the concrete base into their garage. OY0788 AIR RM 1 near Hamer, ID ID JEFFERSON 43.96237975 -112.1679772 HAMER Updated NGS beacon/arrow Beacon destroyed; part of concrete pad remains, as of 10/15/2016. Reported by Kaarin Englemann. Arrow southeast of Boise, ID ID ELMORE 43.365891 -115.956668 MAYFIELD SW SALT LAKE CITY BOISE 27 Y Updated non-NGS beacon/arrow Arrow found in fair condition, as of 3/15/2015. This marker does not appear to have any NGS data sheets associated with it. From Boise, go southeast on I-84 to the Mayfield/Orchard exit. Go north on Mayfield Road 0.6 miles to Desert Wind Road. Turn right (SE) and go 2.4 miles to the intersection of Regina Rd. The marker is approximately 600' north of the intersection on top of a small ridge on the west side of Regina Road on private property. Reported by Glen Smallwood. Beacon tower at Malad City Airport, ID ID ONEIDA 42.16628 -112.287262 MALAD CITY WEST Y Y Updated non-NGS beacon/arrow Kaarin provided information to Arrows Across America. According to the 1932 Airway Bulletin, there was once an arrow, but it is not visible today. It seems that over time, the number changed to 9. No arrow, beacon and generator shed remaining, as of 10/15/2016. Reported by Kaarin Englemann. Destroyed/re-purposed site near Mountain Home, ID ID ELMORE 43.0623 -115.53624 REVERSE Updated non-NGS beacon/arrow Destroyed/Re-purposed, as of 5/4/2015. Details: Scaled the rough location shown on the 1936 Airway Map No 135, and correlated it with a USGS topo quad. Field search located a locked fenced in radio tower on the site, which is on top of a small hill along with a USGS monument (OZ1033) which the datasheet referenced Airway Beacon 23 with an azimuth and distance. It appears that the tower was removed, as the structure is similar, but not the same as the Internation Derrick & Equipment towers. Reported by Glen Smallwood. OH1234 AIRWAY BCN 29 8 MI SE OF BOISE ID ADA 43.50343841 -116.1278545 BOISE SOUTH (1976) N N Updated NGS beacon/arrow Arrow in poor condition. Tower has been removed, as of 3/15/2015. Reported by Glen Smallwood. OZ1010 AIRWAY BN 23 NW OF GLENS FERRY ID ELMORE 43.02737654 -115.3805072 HOT SPRINGS CREEK RESERVOIR (1986) N N Updated NGS beacon/arrow Tower and Beacon Intact, No Arrow, as of 5/4/2015. Details from Glen Smallwood: Did not find any evidence of a concrete slab or arrow at the surface, even under the tower. There was a graded area to the east where a shed would have been. There was no real road access to the site, which probably has helped keep the beacon lens intact. Tower manufacturer was the same as was found at Beacon 25 in Mountain Home. The controller box was manufactured in Switzerland, with a patent date of 1916. Details from Charles W. Voll: Google Earth imagery dated 5/9/2015 shows what appears to be a tower with out an arrow or concrete pad for building. Tower appears to be the same kind used for the airway beacons. Reported by Glen Smallwood and Charles W. Voll. OZ1042 AIRPORT BCN MTN HOME MUN APT ID ELMORE 43.12691802 -115.7274829 MOUNTAIN HOME NORTH (1992) Y N Updated NGS beacon/arrow Tower found in good condition, and is located on the east side of the entrance to the Mountain Home Municipal Airport, as of 3/15/2015. The tower pad appears to be original, however the arrow tip and tail appears to have been demolished when the entrance was constructed. Reported by Glen Smallwood. OZ1045 AIRWAY BN 26 10 MI NW MTN HOME ID ELMORE 43.24590938 -115.8076004 CRATER RINGS (1992) N N Updated NGS beacon/arrow Arrow is in fair condition. Tower has been removed, as of 3/15/2015. Reported by Glen Smallwood. PZ0637 AIRWAY BCN 26 2 MI E OF MONIDA ID CLARK 44.55861124 -112.2884582 MONIDA (1968) N N Updated NGS beacon/arrow Tower and power shed intact, as of 1/10/2015. Reported by Zhanna. PZ0669 POCATELLO BUTTE AWY BCN 23 ID CLARK 44.16885798 -112.2243513 DUBOIS NW (1964) BUTTE POCATELLO 23 N N Updated NGS beacon/arrow Air field is operational--owned by city. Power supplied by city utilities. Arrow intact, 2 sheds intact but no equipment inside, as of 10/13/2015. Reported by Gerald Muller. HG0831 AMARILLO KANSAS CITY BCN 24 KS HARPER 37.15188526 -98.07693797 ANTHONY (1983) AMARILLO KANSAS CITY 24 N N Updated NGS beacon/arrow Arrow and beacon intact, as of 1/2/2015. Reported by John. NEW ORLEANS-ATLANTA AIRWAY BEACON NO. 2 LA ORLEANS 30.166532 -89.737617 RIGOLETS Updated non-NGS beacon/arrow The satellite photograph shows a rectangular reddish colored slab in the position indicated from analysis of the two photographs of the beacon. Beacon destroyed, foundation intact, as of 2/4/2016. Reported by Reese Patterson. Indian Mounds Park Airway Beacon, St. Paul, MN MN RAMSEY 44.9465127 -93.0577422 SAINT PAUL EAST Updated non-NGS beacon/arrow This one has been sitting above downtown St. Paul in in working condition for years. It resides inside Indian Mounds Park, as of 1/29/2016. Wikipedia also references it from the park's page. Reported by Eric Rautio. Beacon #9, northeast of Tarkio, MO MO ATCHISON 40.335292 -95.274431 TARKIO SOUTHEAST KANSAS CITY OMAHA 9 Amber 4 Updated non-NGS beacon/arrow Tower intact. The airway beacon tower is in my front yard. The light was removed but the tower is there, as of 4/18/2016. Reported by Sam Graves. Beacon #10, northeast of Tarkio, MO MO ATCHISON 40.451808 -95.360992 TARKIO EAST KANSAS CITY OMAHA 10 Y Amber 4 Updated non-NGS beacon/arrow The road actually goes around the site of the beacon, which was removed after WWII. This intersection has always been known as Beacon Corner. The tower and shed are gone, as of 4/19/2016. Reported by Sam Graves. Beacon tower N of Bozeman, MT MT BROADWATER 46.54 -111.71 CANYON FERRY SW 1 Updated non-NGS beacon/arrow Airway Beacon #1 ( ._ _ ) points to KHLN and Airway Beacon #5 (. _ . ) near Bozeman, MT (45.965N,111.338W). Still in use and shown on VFR sectional chart Great Falls. Reported by Dan on 8/15/2017. Beacon tower W of Helena, MT MT LEWIS AND CLARK 46.55622 -112.309 MAC DONALD PASS 49 Updated non-NGS beacon/arrow Beacon #49 at MacDonald Pass near Helena, MT. Operational/still in use. Shown on Great Falls sectional Chart. ( - - . ) 49 points to Beacon 47 Garrison (- . . ) and KHLN. Reported by Dan on 8/15/2017. QY0516 AIRWAY BCN 32 DILLON MUN APT MT BEAVERHEAD 45.25255931 -112.5543872 GLEN SE (1979) Y N Updated NGS beacon/arrow Tower and power shed intact, as of 1/10/2015. Reported by Zhanna. QY0531 AIRWAY BCN 30 10 MI SSW DILLON MT BEAVERHEAD 45.07029537 -112.8107947 DALYS (1952) N N Updated NGS beacon/arrow Tower intact, as of 1/10/2015. Reported by Zhanna. Arrow E of Potter, NE NE CHEYENNE 41.214158 -103.252218 POTTER Y Updated non-NGS beacon/arrow Arrow appears intact, but nothing else visible from google aerials. Reported by Patrick Haynes. NP0689 CHEYENNE HURON AWY BCN 17 NE DAWES 42.82877191 -103.0930406 CHADRON WEST (1980) CHEYENNE HURON 17 Y N Updated NGS beacon/arrow Looking at various Google and other maps, the tower was standing in 2012 (visible in Google Street View from a nearby highway). There is a shed nearby which may be the original, slightly relocated. The arrow isn't obvious. 2013 satellite images show the tower on its side on the ground a short distance from its original location. I can't find any more recent photos. Tower may or may not be standing, shed possibly nearby, no arrow obvious. From Kerri Rempp, Chadron Record editor: "I checked with the city public works director who responded that the old tower has been sold, but the buyer is keeping it in one piece with the intention of setting it up at a later date." So the tower was removed from the airport in 2013. Reported by Brian Lee. Arrow in Columbus, NM NM LUNA 31.824812 -107.632076 COLUMBUS Updated non-NGS beacon/arrow Arrow and concrete footing/steps to shack intact, as of 4/23/2017. Reported by Bob Anderson. Arrow SW of Church Rock, NM NM MCKINLEY 35.529398 -108.606455 CHURCH ROCK Y Updated non-NGS beacon/arrow Arrow intact, no tower or shed as of 2017-08-03. Reported by Brian Lee. CF0275 HATCHITA AIRPORT BEACON NM GRANT 31.91861045 -108.3284778 HACHITA (1982) EL PASO PHOENIX 29B Y Updated NGS beacon/arrow Arrow intact, as of 1/5/2015. Reported by John. CF0312 PHOENIX EL PASO AWY BCN 26 A NM HIDALGO 31.92834494 -108.995529 ANTELOPE PASS (1982) EL PASO PHOENIX 26 A N N Updated NGS beacon/arrow Arrow intact, as of 3/23/2015. Reported by Alan Rice. FO1422 LOS ANGELES AMARILLO AWY BN 68 NM BERNALILLO 35.0561878 -106.7944148 LA MESITA NEGRA SE (1990) AMARILLO LOS ANGELES 68 N N Updated NGS beacon/arrow Arrow intact, as of 1/24/2014. Reported by Steve Owen. FO1617 LOS ANGELES ALBUQ AWY BN 64 NM CIBOLA 35.04871257 -107.5461372 CUBERO (1971) ALBUQUERQUE LOS ANGELES 64 N N Updated NGS beacon/arrow Arrow intact, as of 11/19/2013. Reported by David. FO1695 AIRWAY BEACON 68 NM VALENCIA 35.03048733 -106.9762499 LA MESITA NEGRA (1990) N N Updated NGS beacon/arrow Arrow intact, as of 11/25/2014. Reported by Zhanna. FP0466 LOS ANGELES ALBUQ BCN 61 NM CIBOLA 35.0381428 -108.1165609 PAXTON SPRINGS (1995) ALBUQUERQUE LOS ANGELES 61 N N Updated NGS beacon/arrow Generator hut restored, as of 1/24/2014. Reported by Steve Owen. Arrow near KR1596, Derby Dam, NV NV WASHOE 39.578653 -119.490153 DERBY DAM Y Updated non-NGS beacon/arrow Arrow intact, as of 11/16/2013. Reported by Carol. Arrow near Verdi-Mogul, NV NV WASHOE 39.510018 -119.922404 VERDI SAN FRANCISCO ST LOUIS 18 Y Updated non-NGS beacon/arrow Arrow intact, as of 5/13/2015. Reported by David Mansfield. Arrow NW of Bunkerville, NV NV CLARK 36.796826 -114.246549 FLAT TOP MESA Y Updated non-NGS beacon/arrow Arrow appears intact on Google Maps. Reported by Mike on 5/26/2018. Arrow NW of Golconda, NV NV HUMBOLDT 41.00736 -117.59292 GOLCONDA BUTTE Y Updated non-NGS beacon/arrow Visible on Google Earth as of 8/19/2015; this arrow has a bent shape. Reported by Carl Van Cleave. Arrow south of Las Vegas, on hill between I-15 and Las Vegas Boulevard NV CLARK 35.953293 -115.179393 SLOAN Y Updated non-NGS beacon/arrow Arrow intact, as of 2/27/2015 (Roland). Arrow and shed pad intact as of 1/2/2017 (Marici). Reported by Roland R. Rosenberg, Jr. and Marici Reid. Arrow SE of Golconda, NV NV HUMBOLDT 40.92508 -117.39806 GOLCONDA Y Updated non-NGS beacon/arrow From Carl Van Cleave: Arrow intact. From Gerald Muller: Located at Golconda Summit. 6 miles southwest of Golconda, NV and 300-400 feet north of I80. Only arrow and concrete pads remaining, as of 10/13/2015. Reported by Carl Van Cleave and Gerald Muller. Beacon at Humboldt Intermediate Field, NV NV PERSHING 40.085023 -118.156119 BUENA VISTA HILLS NORTH Updated non-NGS beacon/arrow Humboldt Intermediate Field on the airway is an emergency landing airport made of cleared sagebrush in large triangle. The coordinates are for concrete circles in the center of the field. There's later junk & concrete from a defunct mining operation. No arrow; found flagpole base & foundations of office building still there, as of 4/18/2016. Reported by Jack Fawcett. Beacon tower near Polkinghorne Springs, NV NV PERSHING 40.228794 -117.741353 SOU HILLS Updated non-NGS beacon/arrow Complete except glass lens & carbide tanks, as of 6/2/2016. Good yellow paint. No vehicle access. Reported by Jack Fawcett. Tower near Fernley, NV - "216 SF-SL" NV LYON 39.608274 -119.289933 FERNLEY WEST SAN FRANCISCO SALT LAKE CITY 216 Updated non-NGS beacon/arrow Tower intact; partial shed. Reported by Ken Nussear. Tower southwest of Battle Mountain, NV NV LANDER 40.435814 -117.163028 MCCOY NW Updated non-NGS beacon/arrow There is no road to the site. It is out in the flat sagebrush. There is no light or arrow but the tower is intact, as of 4/18/2016. Reported by Jack Fawcett. LQ0620 SAN FRAN SALT LK AWY BCN 50 NV ELKO 40.92786821 -114.294452 SILVER ZONE PASS (1982) SALT LAKE CITY SAN FRANCISCO 50 N Concrete Updated NGS beacon/arrow Arrow intact, as of 2/4/2014. Reported by Decman and Lynn Shepherd. LQ0626 SAN FRAN SALT LK AWY BCN 49 B NV ELKO 40.85171855 -114.4402347 SHAFTER (1971) SALT LAKE CITY SAN FRANCISCO 49 B N Concrete-X Updated NGS beacon/arrow Arrow intact, as of 2/4/2014. Reported by Decman. LR0848 AIRWAY BCN 30 35 MI E LOVELOCK NV PERSHING 40.20595602 -117.8045317 MC KINNEY PASS (1990) N N Updated NGS beacon/arrow Jack saw the 15 years ago when he traveled the road frequently. Recently he found the tin from the shed blown into the trees. Tower is gone now (stolen? ), as of 4/18/2016. Reported by Jack Fawcett. LR0877 AIRWAY BCN 32=WINNEMUCCA APT NV HUMBOLDT 40.90467783 -117.8012237 WINNEMUCCA WEST (1982) Y N Updated NGS beacon/arrow Beacon and shed intact at Winnemucca Municipal Airport, as of 1/15/2015. Reported by Chris. Tower and shed are intact, no arrow, Google street view from 2015 is still the current condition, as of 3/30/2019. Reported by Gary Simas. LS0572 AIRWAY BCN 28 ESE LOVELOCK NV PERSHING 40.07537891 -118.1815223 BUENA VISTA HILLS NORTH (1987) N N Updated NGS beacon/arrow Arrow intact, as of 2/4/2014. Reported by Decman. Only arrow remains, someone painted it orange as of 3/30/2019. Reported by Gary Simas. LS0603 AIRWAY BCN 26 A DERBY APT NV PERSHING 40.06979687 -118.5709184 GRANITE POINT (1987) Y N Updated NGS beacon/arrow Tower and small building intact, no arrow; as of 3/31/2019. Reported by Gary Simas. EL0900 AIRWAY BCN 11 N SPRINGER 1955 OK MURRAY 34.41700899 -97.14981277 TURNER FALLS (1978) N N Updated NGS beacon/arrow Arrow intact, structures next to it look more recent. Looks like the arrow is not directly accessible (fence and gate), however it should be easily visible from outside the fence. Reported by Jens Baumeister, 5/31/2018. Arrow E of Glendale, OR OR DOUGLAS 42.730123 -123.384334 GLENDALE Y Updated non-NGS beacon/arrow Locals know about it and call it the cement arrow. Looks to have been removed when they built a cell/radio tower next to its location. (NGS station WOLF [NZ1212] has RMs set in arrow - Zhanna) Arrow intact. Reported by Blossom Merz. Beacon on Mahogany Mountain near La Grande, OR OR UNION 45.3679 -118.1763 HILGARD Updated non-NGS beacon/arrow Beacon intact, as of 5/17/2014. Reported by David Pinyerd. Arrow near Odessa, TX TX ECTOR 31.914243 -102.364034 ODESSA NORTHEAST Y Updated non-NGS beacon/arrow Arrow intact, as of 8/29/2018. Reported by John Nixon. AF9920 EL PASO FORT WORTH AWY BCN 3 TX HUDSPETH 31.81790551 -105.7822292 BUCKHORN DRAW WEST (1979) EL PASO FORT WORTH 3 N N Updated NGS beacon/arrow Arrow intact, as of 1/5/2015. Reported by John. AF9921 EL PASO FORT WORTH AWY BCN 4 TX HUDSPETH 31.8064499 -105.6278827 BUCKHORN DRAW EAST (1979) EL PASO FORT WORTH 4 N N Updated NGS beacon/arrow Arrow intact, as of 1/5/2015. Site is no more than 100 feet south of Hwy 62. Reported by John. CC0778 FORT WORTH EL PASO AWY BCN 19 TX WINKLER 31.81819534 -102.8698519 AMBURGEY RANCH (1971) EL PASO FORT WORTH 19 N N Updated NGS beacon/arrow Arrow intact, as of 1/5/2015. Reported by John. CD0910 EL PASO FORT WORTH AWY BCN 14 TX REEVES 31.81421278 -104.0293242 SCREW BEAN DRAW EAST (1973) EL PASO FORT WORTH 14 N N Updated NGS beacon/arrow Arrow intact, as of 1/5/2015. Reported by John. CD0923 EL PASO FORT WORTH AWY BCN 12 TX CULBERSON 31.83364681 -104.2915199 CASTILE HILL (1973) EL PASO FORT WORTH 12 N N Updated NGS beacon/arrow Beacon and arrow intact, as of 11/18/2013. Reported by Ken Drews. CD0971 EL PASO FORT WORTH AWY BCN 11 TX CULBERSON 31.85327799 -104.5490172 COW MOUNTAIN (1973) EL PASO FORT WORTH 11 N N Updated NGS beacon/arrow Arrow intact, as of 1/5/2015. Tower is gone but the generator building still looks to be intact. This also looks to be an old air strip; there is a fence around a larger area with destroyed landing strips. Reported by John. CD0995 EL PASO FORT WORTH AWY BCN 9 TX CULBERSON 31.83282584 -104.8091443 GUADALUPE PASS (1973) EL PASO FORT WORTH 9 N N Updated NGS beacon/arrow The beacon site is approximately .75 NNW of the location given on this site (heading of 328°) on the West side of the road that accesses the transmitter sites at the currently listed location. Found on 1932 aeronautical chart in University of Texas online map collection. Cross referenced to this site for coordinates. Checked coordinates against 1955 USGS Topo Quad map on USGS website. Confirmed location of remains with Google Earth. Reported by Dave Tenney, 2/17/2017. CD1004 EL PASO FORT WORTH AWY BCN 8 A TX HUDSPETH 31.74596454 -105.0816368 SALT FLAT (1984) EL PASO FORT WORTH 8A N N Updated NGS beacon/arrow Arrow intact, as of 1/5/2015. Reported by John. CD1012 EL PASO FORT WORTH AWY BCN 6 TX HUDSPETH 31.78014087 -105.3511962 MICKEY DRAW WEST (1984) EL PASO FORT WORTH 6 N N Updated NGS beacon/arrow Arrow intact; foundation of building remains, as of 1/5/2015. Reported by John. CU0947 AIR BEACON 36 TX NOLAN 32.4570724 -100.2906566 LAKE SWEETWATER (1987) N N Updated NGS beacon/arrow Arrow intact, as of 1/5/2015. Reported by John. CU0955 SWEETWATER MUNICIPAL APT BCN TX NOLAN 32.45835304 -100.4647039 SWEETWATER (1987) Y Updated NGS beacon/arrow Destroyed, as of 1/5/2015. Reported by John. CU1130 AIRWAYS BEACON 26 TX MIDLAND 32.0775145 -101.9480896 GERMANIA (1974) N N Updated NGS beacon/arrow Arrow intact, as of 1/5/2015. Reported by John. DM1254 DALLAS LOUISVILLE AWY BCN 12 TX MORRIS 33.29750496 -94.73508041 DALBY SPRINGS (1975) DALLAS LOUISVILLE 12 N N Updated NGS beacon/arrow Destroyed, as of 11/20/2013. Reported by Cary. Arrow northeast of St. George, UT UT WASHINGTON 37.1806131 -113.4004053 HARRISBURG JUNCTION Y Updated non-NGS beacon/arrow Arrow intact, as of 3/23/2015. Reported by Alan Rice. Arrow southwest of St. George, UT UT WASHINGTON 37.0648086 -113.5952549 SAINT GEORGE Y Updated non-NGS beacon/arrow Arrow intact. Reported by Alan Rice (03/23/2015) and Brian Lee (04/17/2017). HO0622 LOS ANGELES SALT LK AWY BN 37B UT WASHINGTON 37.11745018 -113.4876398 WASHINGTON DOME (1986) LOS ANGELES SALT LAKE CITY 37B N N Updated NGS beacon/arrow Arrow intact, as of 2/4/2014. Reported by Decman. KO0429 AIRWAY BEACON 50 UT MILLARD 39.10238762 -112.700986 CLEAR LAKE (1971) N N Updated NGS beacon/arrow Destroyed, as of 11/12/2013. Reported by Dean Draper. KO0431 LOS ANGELES SALT LAKE AY BN 50 UT MILLARD 39.17037232 -112.643209 SUNSTONE KNOLL (1971) LOS ANGELES SALT LAKE CITY 50 N N Updated NGS beacon/arrow A foundation is visible in the most recent Google Earth images. It could be the foundation for the generator shack. Reported 7/15/2018 by Brian Lee..
LO0818 PORCUPINE PK AIR BCN PROP TYPE UT MORGAN 40.86686718 -111.5250099 BIG DUTCH HOLLOW (1975) N N Updated NGS beacon/arrow Shed is visible on Google Earth as of 7/16/18. Reported by Brian Lee. LO1031 LONE BEACON UT DAVIS 40.8859304 -111.949273 FARMINGTON (1975) N N Updated NGS beacon/arrow Arrow visible on Google Earth as of 7/16/18. Reported by Brian Lee. LP0424 BEACON 61A NEAR STA LAKE POINT UT TOOELE 40.70455414 -112.2536268 MILLS JUNCTION (1972) N N Updated NGS beacon/arrow Double tailed arrow visible in Google Earth as of 7/16/18. Reported by Brian Lee. LP0447 BEACON 59 AT STOCKTON 61A UT TOOELE 40.45839433 -112.3637559 STOCKTON (1993) N Concrete Updated NGS beacon/arrow Angled arrow visible in 2017 Google Earth image. Reported 7/16/18 by Brian Lee. Some breakage due to settling but arrow is intact - on top of Stockton Bar; no tower. Reported 8/16/18 by Art Johnston. LP0470 MICHAEL AFB AIRWAY BEACON UT TOOELE 40.1840099 -112.9297127 CAMELS BACK RIDGE NW (1993) N N Updated NGS beacon/arrow Tower intact and visible on 2013 Google Earth images. Reported 7/16/18 by Brian Lee. LP0482 SAN FRANCIS SALT LK AWY BN 59 UT TOOELE 40.75002521 -112.6482391 POVERTY POINT (1968) SALT LAKE CITY SAN FRANCISCO 59 N N Updated NGS beacon/arrow Arrow visible in 2017 Google Earth image. Reported 7/16/18 by Brian Lee. Arrow is located nearby Timpie Springs Waterfowl area; arrow intact, tower gone as of July 2018. Reported 8/16/18 by Art Johnston. LP0496 SAN FRANCIS SALT LK AWY BN 57 UT TOOELE 40.82650828 -112.9057424 LOW (1973) SALT LAKE CITY SAN FRANCISCO 57 N Concrete-X Updated NGS beacon/arrow Out geocaching in the west desert - there is a geocache located nearby this beacon. Complete concrete arrow is intact, tower is gone, as of 11/2/2015. Reported by Art Johnston. Arrow near Tyler, WA WA SPOKANE 47.4153 -117.7384916 LANCE HILLS Y Updated non-NGS beacon/arrow On private land. Arrow largely intact, no tower or shed, as of 3/31/2016. Reported by Pete Hill. Arrow E of Cheyenne, WY WY LARAMIE 41.164783 -104.674512 ARCHER Updated non-NGS beacon/arrow 42 SL-O Westedt. The Farm Owner has left the area intact and plowed around the site. A bit hard to see from the road, surrounded by grass. Only the cement slabs remain, surfaces in fair condition and a block or 2 tilted a bit. Arrow head apparently buried under growth and dirt, as of 2/2017. Reported by Marty P.
Arrow near Bryan, WY WY SWEETWATER 41.562095 -109.678058 BRYAN Y Updated non-NGS beacon/arrow This site is visible in Google Earth. Found this arrow several years ago and researched what it was. Just found this interactive site today when explaining the arrow to someone. Arrow intact, as of 5/10/2016. Reported by Dan Quinn. Beacon #40 on Salt Lake-Omaha route; near Silver Crown district, northwest of Cheyenne, WY WY LARAMIE 41.19686944 -105.047817 SILVER CROWN SALT LAKE CITY OMAHA 40 Updated non-NGS beacon/arrow Jeff: I believe this to be beacon #40 (Morse code M) on the Salt Lake-to-Omaha route. If so, there may be some confusion on the numbers of the beacons known to you as MO1245 & MO1218. Satellite views show base intact head-to-tail, tower and shed gone, as of 3/12/2016. Reported by Jeff Johnson and Petra Ondracko. Tower at Medicine Bow Airport, Medicine Bow, WY WY CARBON 41.8870388 -106.1900888 MEDICINE BOW Y Y Updated non-NGS beacon/arrow Beacon and arrow intact, as of 11/20/2013. Reported by Jim. MO1117 AIRWAY BCN 1 18 MI N CHEYENNE WY LARAMIE 41.40224764 -104.8660544 LEWIS RANCH (1991) N N Updated NGS beacon/arrow Destroyed, as of 11/20/2013. Reported by Steve. MO1218 SAN FRAN NEW YORK AWY BCN 38 WY LARAMIE 41.22623299 -105.2432057 HECLA (1978) NEW YORK SAN FRANCISCO 38 N N Updated NGS beacon/arrow Arrow intact, as of 2/4/2014. Reported by Decman. MO1245 SAN FRANCISCO NEW YORK AIRWAY BEACON 37 WY ALBANY 41.26787527 -105.4336813 PILOT HILL (1992) NEW YORK SAN FRANCISCO 37 N N Updated NGS beacon/arrow Arrow intact, as of 2/4/2014. Reported by Decman. MO1266 SALT LAKE OMAHA AWY SITE 36 BN WY ALBANY 41.44562939 -105.6403333 BAMFORTH LAKE (1978) OMAHA SALT LAKE CITY 36 N N Updated NGS beacon/arrow Foundation visible in Google Earth as of 7/16/18. Reported by Brian Lee. MP0518 SALT LAKE OMAHA AWY SITE 31 BN WY CARBON 41.85028546 -106.4402937 CARBON (1971) OMAHA SALT LAKE CITY 31 N N Updated NGS beacon/arrow Arow intact, as of 6/22/2015. Reported by Rich. MP0580 SALT LAKE OMAHA AWY SITE 29 BN WY CARBON 41.81707169 -106.6767609 DANA (1982) OMAHA SALT LAKE CITY 29 N N Updated NGS beacon/arrow Arrow intact; nothing else visible as of 6/22/2015. Reported by Rich. MP0608 SALT LAKE CITY OMAHA AWY BN 27 WY CARBON 41.80225421 -107.060577 SINCLAIR (1981) OMAHA SALT LAKE CITY 27 N N Updated NGS beacon/arrow Generator pad intact; no arrow visible, as of 6/22/2015. Reported by Rich. MQ0447 SALT LAKE OMAHA SITE 20 BCN WY SWEETWATER 41.65742323 -108.5630694 BITTER CREEK NE (1978) OMAHA SALT LAKE CITY 20 N N Updated NGS beacon/arrow Generator pad intact; no arrow visible, as of 6/22/2015. Reported by Rich. MQ0449 SALT LAKE OMAHA SITE 17 BCN WY SWEETWATER 41.67164858 -108.9413153 THAYER JUNCTION (1978) OMAHA SALT LAKE CITY 17 N N Updated NGS beacon/arrow Arrow intact; tower pad intact; generator outline visible, as of 6/22/2015. Reported by Rich. MQ0469 SALT LAKE OMAHA SITE 15 BCN WY SWEETWATER 41.57842554 -109.3211158 KANDA (1978) OMAHA SALT LAKE CITY 15 N N Updated NGS beacon/arrow Beacon destroyed. There is a little concrete here and some broken glass from the lens as of 2017-07-02. Reported by Clark D. Hall. MQ0471 AIRWAY BCN 15 4 MI ENE GREEN R WY SWEETWATER 41.55166768 -109.3893163 GREEN RIVER (1980) N N Updated NGS beacon/arrow Square concrete foundation is all that is left as of 2017-07-02. Reported by Clark D. Hall. PW0476 AIRWAY BCN 28 ENE KEARNEY WY JOHNSON 44.55131376 -106.7748048 BANNER (1977) N N Updated NGS beacon/arrow Concrete pad is visible in Google maps, no arrow or structures are visible as of 2017-07-30. Reported by Brian Lee. 88 thoughts on Airway Beacons List—Western U.S. I am trying to find out how these more remote beacons were powered as I intend to use one or more in a fiction story. I know many were in remote or hard-to access locations so I wondered what kind of generator or power supply was used to fuel the lights and operate the rotating mechanism for them. I recall the one on Woodchute Mtn north of Jerome, AZ and many scattered across north central Arizona from my childhood in the late 1940s and early 1950s. They quite fascinated me as a child and i’d look for them when we were out somewhere on a trip and coming home late in the evening or after dark. Wherever possible, commercial power was used to operate the beacons and course lights. When economically feasible, power lines could be run up to several miles to service a beacon site. However, there were many airway sites that were so remote and inaccessible that engine/generator sets – essentially farm light plants – had to be located with or near the beacon tower. In a fortunate bit of historical serendipity, the necessary technological improvements to these electric plants (self-starting; not dependent on glass storage batteries; improved reliability, etc.) were perfected just in time to enable the rapid development of the federal lighted airways beginning the 1920’s. 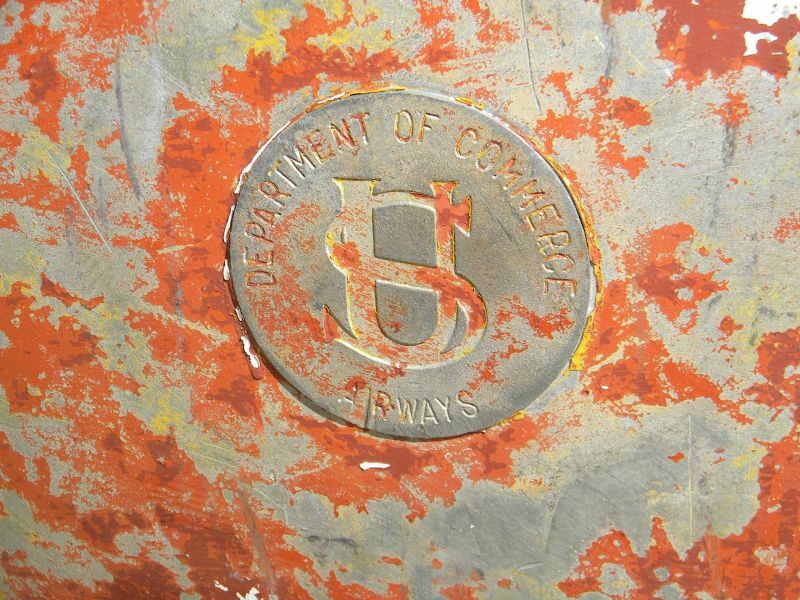 Initially, several manufacturers, including Delco, Westinghouse and Kohler, provided these units to the Post Office Department, and after 1926, to the Department of Commerce. Eventually, the Kohler electric plants became the standard on the lighted airways. Initially, 800 and 1000-watt plants were used, but as the power requirements for beacon sites increased, 1500 and 2000-watt units were specified. Where beacon towers were located on high, rough terrain, such as the remote mesa’s of New Mexico, the generators were often located at the base of the mesa or mountain, with power lines strung up to the tower. In these cases, 3000-watt Kohler generators were sometimes used to meet the additional demands of getting the current up to the beacon. At Dept. 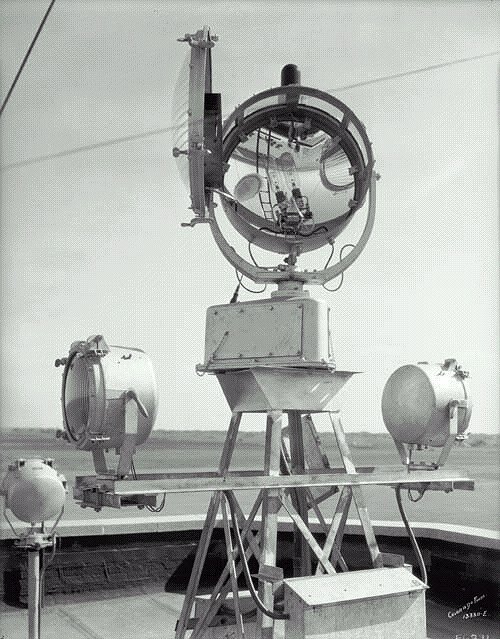 of Commerce “intermediate landing fields,” the rotating beacons were supplemented by airfield lighting (boundary lights, obstruction lights, etc. ), all of which required larger generators, usually in the 5000-watt (5kw) range. A typical remote beacon site would have two generators, mounted side-by-side (sometimes slightly staggered), each on its own concrete pedestal. Each plant was normally operated on alternate nights, controlled by a specially-designed, Swiss-made astronomic time switch that was a technological marvel of its time. All of this equipment – the generators, astronomic time switch and other electrical circuits and switches – would typically be sheltered inside a 10′ x 14′ metal-clad shed of standardized design. Remains of these sites can still be found throughout the country, particularly in the western states. Common identifying features are the 10′ x 14′ foundation walls and the two prominent concrete generator pedestals. Some of the early sites have large concrete arrows. After visiting (sometimes with great difficulty) just a few of the more inhospitable beacon locations, you can’t help but gain an appreciation for the incredible grit of the original “airways mechanicians” and their successors, who serviced these sites and made the system something that aviators could depend on. Some of these airway beacons continued to operate well into the 1960’s. The beacon on Schnebly Hill (Los Angeles-Amarillo Site 42), near Sedona, was the last of the big airway lights to be decommissioned in Arizona. It went dark in 1968. The airport beacon tower at Cottonwood Airport is a former airway beacon site (LA-A 40) that is still operating in its original location. The Woodchute Mtn. beacon (LA-A Site 39) was decommissioned in 1965. I have one of these airway beacon lights. Just like the big one in your picture with the triangular base. Does anyone have any info on buying a new bulb. Sorry for the delayed response. The type of bulb needed depends on the lamp fixture that is currently in your beacon. An old beacon can have a newer fixture installed. Originally, the early style (1928 spec.) 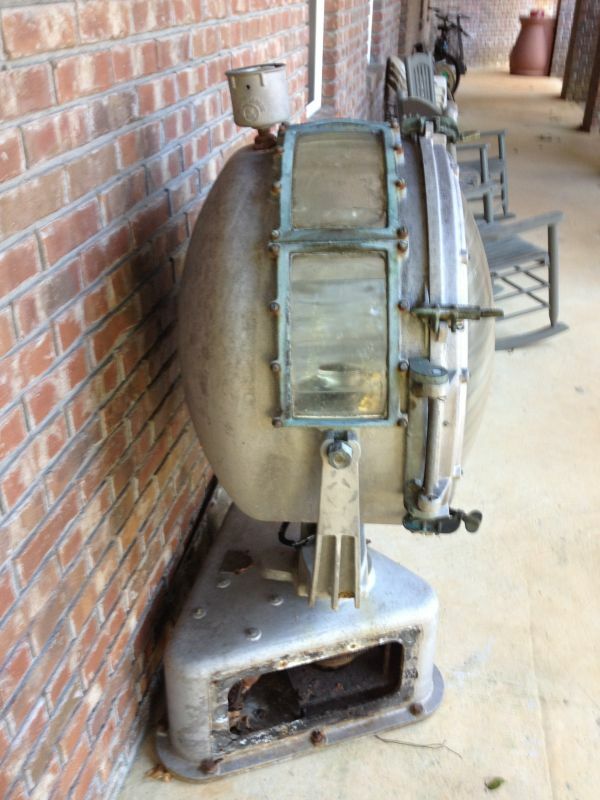 24″ beacons had two 1000W T-20 mogul screw-base bulbs. Later, 1000W T-20 mogul bi-post bulbs were used. Over time, other “Airway Beacon” bulbs were used as the automatic lamp changers were changed or modified. An old airway beacon that was retired and later used as an airport beacon may now have a more modern fixture utilizing a modern lamp (halogen, etc.). Airway beacon bulbs are usually available at online auction sites like eBay. They are often very expensive and just as often remain unsold. Wait a while and you’ll find one for a reasonable price. With decent packaging, they are surprisingly resistant to damage during shipping. With photos, I may be able to tell you a bit more about your beacon. Hello, where can I find the beacon number or where it was originally located? Oval plate has Department of Commerce made by Crouse-Hinds, serial #424. Next to it has a circular US Airways Department of Commerce plate. Thank you in advance. I apologize for the delayed response. It is currently very hard to determine the location where a particular surviving beacon served. Those records, if they were ever maintained, have not been located. After years of examining data plates, I have come to the conclusion that the serial numbers represent the number within a particular contract batch, rather than an overall Dept. of Commerce serial. This is primarily because there are duplicate data plate serials between manufacturers and beacon types/production periods. Beacons tended to be ordered by the DoC in quantities ranging from 150 to 500 (usually multiples of 50), so serial number 424 was likely the 424th beacon produced by Crouse-Hinds under a contract for, say, 450 or 500 beacons. At least that’s my working theory. While it’s hard to know precisely where your beacon served, sometimes there are clues regarding its history. With photos, I could probably tell you a little more. If you can find the 1932 USGS map 1:96,000 scale, they have the beacons marked on them. You can fill in the Truckee, CA area using that map, there are six listed. Yreka map has one as does the map to the east of it. 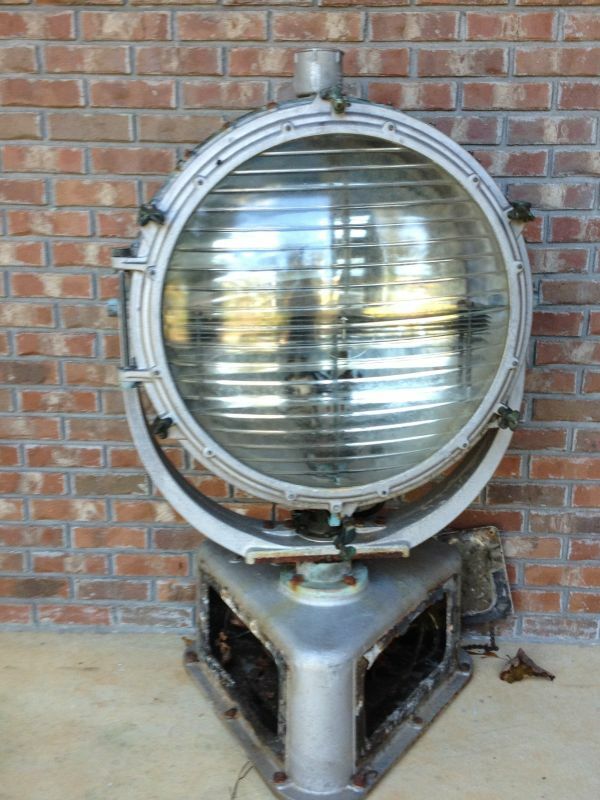 Does anyone have a wiring diagram for these lights? I recently acquired light #99 and was told it came from the Marana Air field in Arizona. 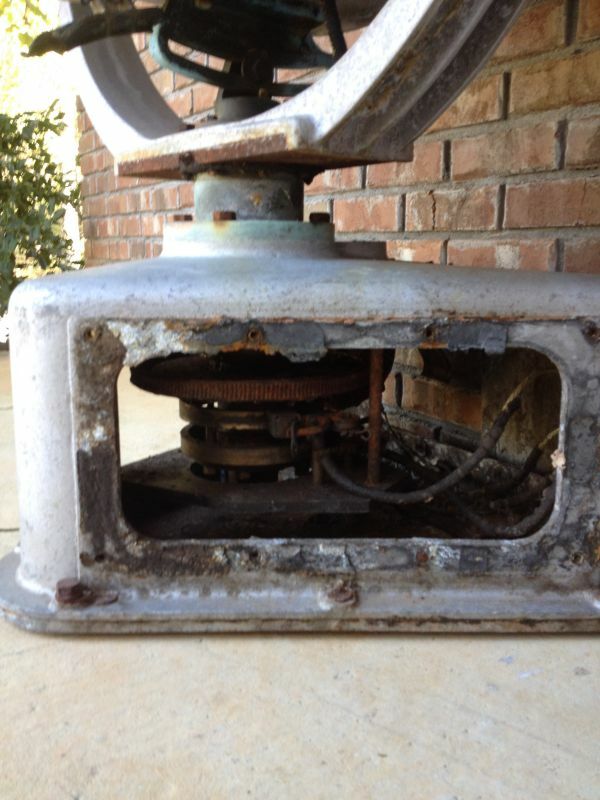 I would like to restore the light to its original condition and functioning. Can anyone help him out? Reply and I’ll put you in touch. You might try to contact Steve Owen on the below link. His group has been doing some excellent restoration projects. DX5100 is in the middle of the windmill farms.which I don’t believe can be accessed. The satellite image clearly shows the beacon and small structure next to it. I don’ t see an arrow but am unclear on how close the arrow would be to the beacon if there was one. Nice find, Elizabeth! I’ve added your update to the map. Not all beacon sites had associated arrows. While it’s not definitive, the fact that the original description for this site doesn’t mention an arrow is an indication that there may never have been one here. I have received the following suggestion from Steve Bennett. I’m sure it will be helpful to many beacon-seekers! EarthExplorer has been added to the list of Resources. I have a suggestion for anyone hoping to find one. If you look in Google maps satellite view and see nothing but green trees, do not despair. You have other options. Use http://earthexplorer.usgs.gov/. On the data sets tab expand aerial imagery and choose either “aerial single frames” or “high resolution orthoimagery”. The trick is look for imagery taken in the winter months when the leaves are down and you have a better view of the naked landscape without all the foliage blocking the view. The aerial single frames images go farther back in time. It is not uncommon to find 1950s images there. I have received the following message from Cameron. Please respond if you have any information that would help! Grandfather has an old airway beacon, he past away and don’t know anything about it, hope you could help me. It’s made by Sperry Gyroscope Co. INC.
Brooklyn N.Y. 110volts A.C. C.Y. PT-72834 SER-4017. He use to work at Maxwell Air Force Base back in the 50’s & 60’s and I think he got there. Your question about your grandfather’s old rotating beacon was forwarded to me from Zhanna via Steve Owen in Grants, NM. From the photographs, I can tell you the following: Your beacon was manufactured between 1927 and about 1934. It is most likely from the 1928-1931 period. Your beacon is almost certainly not from a military base, as it would be configured differently (dual drums, different lens, etc.). The beacon is in remarkably original condition, including an original type main lens. The four glass panels along the top of the drum were called “zenith” lenses, and they are among the features that can be used to date the beacon. I couldn’t tell for sure from the photos, but it appears that you may have the original type of automatic lamp changer inside the drum (relatively few of those have survived). Most of the surviving 24″ beacons today were in use for many decades – first on the airways and then at airports – so periodic refurbishments, modifications and upgrades often resulted in the loss of original components. The drive system looks pretty rough – it may or may not be restorable – but most everything appears to be there. Overall, a very nice artifact from the Golden Age of Aviation. Thanks for sharing the photos. If you can, send pictures of the data plate and the interior of the drum – from those, I can provide additional information. I’m glad your grandfather saved it from the scrap heap! Let me know if you have any other questions. Copyright for the third photo is unknown. It shows a brand new 24″ beacon, almost identical to Cameron’s, atop the new terminal building at Denver Municipal Airport (Stapleton) in 1929. Ran into an intact airway beacon with generator building on the top of Mahogany Mountain near La Grande, Oregon. 45.3679, -118.1763 My question is: How rare are intact beacons in Oregon? I found one today on the San Francisco – Seattle route. It’s not listed above, But has to be BCN 30 something. Douglas County, above Wolf Creek Oregon. I have some pictures, It’s visible on Google maps, to the right of the cell towers. The cell tower obscures its it somewhat due to the angle of the photo. Found these arrows in fairly good shape all around Wyoming, Nevada and Utah. Will visit and photograph these this summer. into the search and press enter. So, in a matter of a few hours, I collected the data sets from this page and the EAST page and made a Google Fusion Table map of the beacon positions. Each beacon point has all of the data associated with the NGS survey data. Is there a way to locate these on google maps? Where can I find latitude and longitude for them? Thanks. 40 17 36.88597(N) 078 15 37.07212(W) (for example) are the GPS coordinates, in degrees/minutes/seconds format. You can plug those coordinates into Google Maps/Earth to do your search. Good luck! I have tried various times to use goole earth to do this, are there spacing requirements I should be aware f? I have tried the numbers with and without spaces, and google earth always tells me they could not understand the location. It might be the N and W that are messing it up. You should be able to use the format 40 17 36.88597 -078 15 37.07212 (for example, for the above coordinates). The negative longitude means West (the positive latitude means North). You can also try the coordinate converters here: http://www.gpsvisualizer.com/calculators to generate other formats that might work better. Please let me know if this helps! Also want to mention 3 beacon sites not on this California list; all are in San Bernardino County. I have been to all 3. (I used Acme Mapper for the co-ordinates.) Squaw Mountain: 35.45934N 115.86433W Kelly (Kingston) Intermediate Airfield: 35.56241N 115.71463W Mesquite Pass (caution – it is inside a Wilderness Area): 35.62491N 115.63303W I think, but am not sure, these 3 beacons were on the LA to Salt Lake City route. Kelly Field had a caretaker’s house/office, beacon, compass circle, and other facilities. Concrete slabs remain. The house/office was moved to Baker in the 1950s. It (and the Silver Lake Field house/office also moved to Baker) were destroyed last year for a parking lot. If 4-way radio beacon sites can be included in this website, a site of one is just north of the old Silver Lake Airfield, north of Baker. I have not personally checked it out, but it appears that there is an intact tower in Medicine Bow, WY (Carbon County). There is a photo on http://www.flickr.com/photos/56597497@N06/8030854106/in/photolist-deEe8Q The coordinates for Google Earth are 41°53’13.34″N 106°11’24.32″W. Thanks for putting all this work into your site! located LQO 620 on google earth. I hunted deer and chucker all over Silver Zone and never ran across this arrow. Will be making a road trip soon to have a look!! I will clarify after looking at Google street view. the site of DM1254 is still there. You can see where the area was never plowed and a tree has grown. The tower is not there. Looks like DM1254 is still standing but stripped and possibly the generator shack. I am not sure on that though. There is a small metal roof close to it. Will drive out and check it out. I have looked at this location and did not find any remains. Are there any remnants of any of these beacons in WA state? I have a plane based at Skagit Airport (KBVS) and would love to try to find some of these. Unfortunately it looks as if most everything has been dismantled. Thanks! Check out TR1164. It’s very close to the airport. There is something at the coordinates; it’s not an arrow and doesn’t look like a beacon, but it’s worth investigating. MO1218 is still there. It’s just sort of in the back country and I think it’s on private land so it’s almost impossible to get to. But it still exists! Nice find! That’s FO1617, LOS ANGELES ALBUQ AWY BN 64. Be aware of land ownership, most of the beacon sites in western New Mexico are Indian tribal lands and you would need to apply for a permit to visit. Exceptions are LA-A 61 and 62 on national forest lands, and LA-A 68 on the edge of Albuquerque (1929? TAT site, top of Nine Mile Hill, 1/2 mile south of I-40). LA-A 59B is at a private residence and 60 is on private land near El Morro but the generator site can be visited by checking at the coffee/gift shop. Other TAT beacon sites (route abandoned by 1930-31) are beside I-40 in the highway right-of-way at Churchrock Road and at Prewitt on private land. West of Gallup to the AZ border, none has been confirmed yet. The TAT beacons were relocated long before the gov’t began surveying these sites. Apparently. Any info or help in finding one of these would be appreciated. A couple are close to my current residence and two are near my home town, I have tried to follow turn by turn and coordinates, but land up in different sites. i believe that road names have changed from the 1930’s and today. This is a very cool thing. While working on airplanes at the Pinal air park in Marana AZ we came across one of these markers but no arrow. It was however embedded in the concrete outside the south end of the hanger on the south end of the tarmac. We never did find out what the marker was for. Is this one of your markers? I am interested in doing field searches for the 3 beacon sites in Pima Co. Is there a way to use Google Earth and the data found here to locate these sites? Yes, click the PID links for the beacons you’re interested in searching for (in your case, CZ1821, CZ1965, and CZ1980). 32 03 43.66343(N) 110 39 06.95973(W) are the GPS coordinates, in degrees/minutes/seconds format. You can plug those coordinates into Google Maps/Earth to do your search. Good luck! CD0923 looks red/orange on Google Maps. It was easy to find following the lat/long in the discription. I’ve just added one of these arrows to OpenStreetMap – http://www.openstreetmap.org/browse/way/246901872 – and would encourage others to do likewise for the remaining examples. OpenStreetMap is a wiki – anyone can edit it. Let me know if you want me to keep finding them, or if you want to know updates on any of them that I already searched via Google Earth. Sure, I’d like any updates you can provide! Thanks so much. I have never heard of nor seen any of the arrows and would like to check out the Julian, CA arrow. Is there an address or GPS location I can use to find the arrow? To obtain the GPS coordinates, click the PID link on the list for the beacon you’d like to find (in your case, DX4994). That will take you to the NGS datasheet for that beacon, and the datasheet has the coordinates right at the top, under CURRENT SURVEY CONTROL, in degrees/minutes/seconds format. For the Julian beacon, the coordinates are 33 06 06.99256 N 116 34 44.35360 W. You can plug them into Google Maps just like that, or convert them to decimal degrees or any other format you prefer to work with. How does one get permission to go on this private property? It is owned by the Afton Canyon Ranch. We stopped nearby, but did nor venture on the property. We did go to the one at Halloran Springs, east of Baker. We drove all the way to the arrow itself. I visited this site with my son, here are the pics. I found FS1273 LOS ANGELES LAS VEGAS BN 17 CA SAN BERNARDINO SOLOMONS KNOB on Google Earth. It’s at 35 23 58.7 -115 49 52.6 Based on the satellite images it looks like it might be in good shape. That’s a very nice find! Thanks, Laura! That’s great! Please feel free to submit your directions here along with any other information you have. Any info. on beacons around the Cheyenne, WY area? The two closest (from the NGS database) would probably be MO1117 and MO1218. I am about 99% positive MO1218 (the one visible on Google Earth) is on private land. If you scroll out you can see an easy way to access it from North Crow Rd in Curt Gowdy State Park. I have been up that road though and there is a no trespassing sign at a cattle gate about 1 mile north of Happy Jack Rd. MO1117 appears to be just east of exit 29 off I-25 on an unnamed access road, but from Google Earth anyway there doesn’t appear to be anything there (which seems odd to me since the only structure within about a 1.5 mile radius is a single farmhouse). That’s a great find, Jeff! It shows that San Francisco-Seattle Beacon 27 has had two locations. I haven’t yet determined which is earlier. I’ve hiked up to the MX1005 location (0.32 statute mile SSW of the I-5 interchange) and only saw some broken concrete and a fragment of a beacon bulb base. Pretty well cleaned up! Your arrow find is 0.94 mile WSW of MX1005. Have you been there? Easily accessible? This was so much fun! I think I might look for others when I have the time. Let me know if you’d like me to follow up if I find any others. It is exciting! This is the same feeling I get when I search for old survey markers. Thanks for searching and locating the arrow, and yes, I’d love to see others that you might find! Logs on Geocaching.com indicate that the beacon itself is destroyed. Hey… I live by this one! I am so excited…I want to go check out the arrow. Is this one the Derby Dam arrow? Fits in regard to the coords nearby to the Derby Dam! Thanks Zhanna. We just did a story on Salt Lake City UT KUTV Channel 2 news last evening about the arrows and beacons. You might update the video link to https://www.youtube.com/watch?v=_phcaAMPZaE It sesems the station has taken the story down from the kutv web site. Unless I missed something I find no mention of the intact beacon on top the mesa east of Trinidad, Colorado and northeast of Raton, New Mexico.From the air everything appears to be intact with the generator shed and a small building for workers who may get stranded on top the Mesa when it snows. The tower appears to have a beacon on it and everything seems to be in good shape. I have photos if you’re interested. From the New Mexico side the Mesa is Bartlett Mesa. We live in Rapid City SD and often travel to the SW on I-25. We are really interested in historical sites having followed the Oregon trail and Lincoln Highway on previous road trips. We would like to incorporate visit s to existing airway beacon sites on future trips. Do you have coordinates for this location and is there a drivable road to the location? Any help would be greatly appreciated. Thank you. course marker airway beacon? It has been completely restored. I am interested-can you send pictures/details? Thanks for contacting me! So far I haven’t been able to find any information online about this beacon. I do have some topo maps of that area. Can you give me the approximate coordinates of the shed you found, or a general description of where the beacon was (which section of the city, nearby street names, etc.)? Could you send me the aerial photo as an attachment? That might help me narrow down my search. Please send any other photos or images you have, too. I’m even wondering if the “406” might indicate an elevation benchmark at the site since 406 feet is a possible value for height in the area. If there is a benchmark at the spot, its description might give us more information about the beacon. I was amazed this morning when a friend showed me a map of the Airway Light Beacons in the east San Francisco Bay area all the way to Reno. Archaeology and the establishment of true history is my passion. I fly all over the western states and have often thought about how our predecessors live and what record they left for us. After a career as a research Physicist, I am now back into Archaeology. I found my way to the B-17 that went down on a trip frm Reno to the Bay area; a nice hike, but poorly described w/o Long & Lat. I fly the Bay Area to Truckee quite often and now I have something to look for on the ground. A suggested search, air and ground, welcomed. Would you please contact me off list? I have extensive information about a beacon in the San Francisco area. Thanks. Not sure how to contact you off list, Sorry! Do you have info. about a beacon in the SF area that you can share? I’d love to learn more. We have just finished an extensive restoration of the beacon, and it is ready to light on December 7, Pearl Harbor Day. We are still searching for a beacon and course lights for our museum. What little we have found has ownership issues, of course. Our 24″ and 18″ replicas won’t last forever. Thank you for your comment and the information about your museum! It appears to be coming along great. I will check out the beacon location you mention. Best of luck finding a beacon and lights! has tower leg stubs, pole line, and generator shed foundations? I know of another site near Williams not listed here that appear to have a beacon foundation. 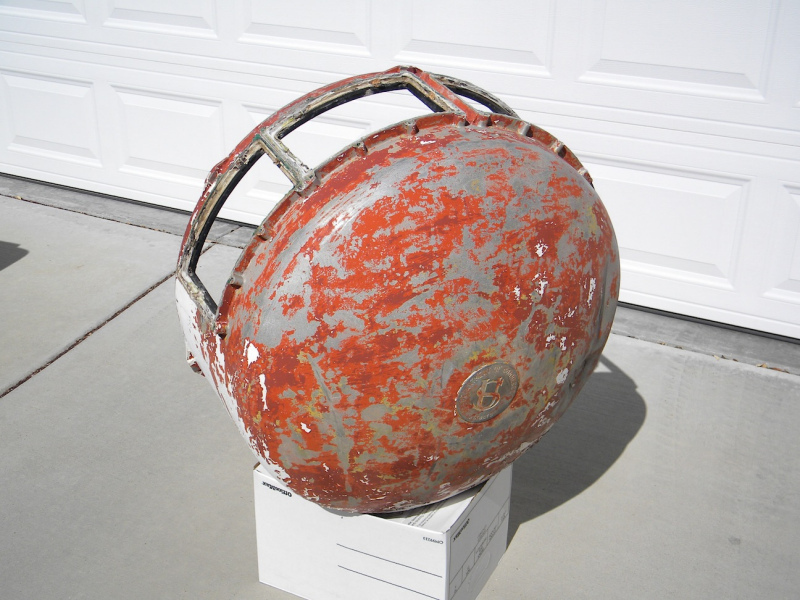 Steve – I would like to contact you about a beacon/arrow restoration project in Idaho. I would like to learn from your experience. The phone number I have for you didn’t work and I don’t have your email address. If possible, please contact me at kengelm@yahoo.com. I went to summer camp from 1959 through 1962 at Foothills Ranch in Northern New Mexico. The Thompson Ranch airway beacon was visible from the ranch and every two weeks the camp took all of the campers to Starvation Peak where we used the ladder and rope system that was permanently installed, climbed the peak and had lunch underneath the beacon. I am now an FAA inspector and was recently in Clayton, NM where the airport manager told me that the airport beacon used to be the Glorieta Pass beacon. Since there is no record of a beacon in Glorieta Pass, the Thompson Ranch beacon seems to be the closest possibility. Those summers were some of the best days of my childhood and it is great to think that I have found the beacon that was visible every evening from the ranch. Would there be anything on the beacon that would identify it? I intend to return to Clayton in the not too distant future and would love to verify that this is the same beacon. Thanks for your great story! I sent you an e-mail about checking the NGS datasheet for descriptive information as well as coordinates, in case you decide to hike to the beacon. If you do locate the beacon again, feel free to send photographs and any other documentation you have. Have info for Imperial County Airway Beacon (DB1497). I am currently restoring to original condition for Imperial County Historical Society. Lites & rotation mechanism restoration complete. Tower is painted & erected. Conduit, wiring & switching progressing. Expect complete operation this year. Thank you for the update, and for all your work on the beacon! Please post back if you have photos, a website, or any other documentation or updates to share because I would love to add them to the site. Could you contact me about your experience of restoring the beacon for the Imperial County Historical Society. I am working on a similar project for the Idaho Historical Society and would like to talk to you about lessons learned.